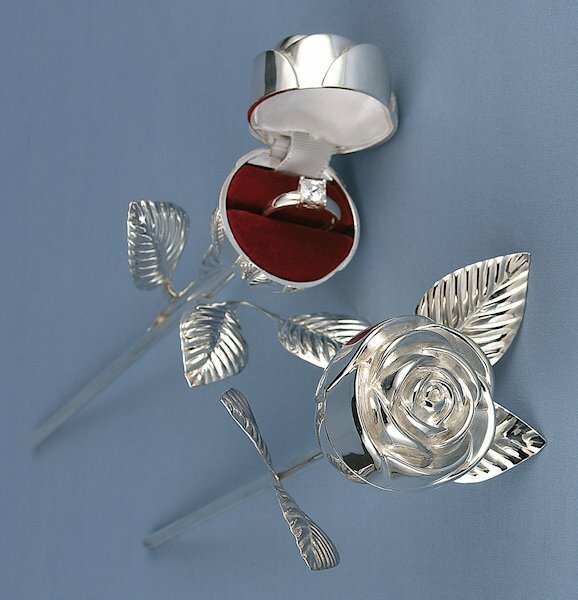 Beautiful by itself, this silver-plated rose holds a secret inside. The flower is actually a ring box with satin and velvet lining. Throughout history, roses have been visual symbols of love, beauty, war and politics. They were used as confetti, as medicinal treatments and as a source of perfume. Perfect for a proposal or as an alternative to the traditional ring bearer pillow, this ring box will make history. Sold as a single rose, it measures 9" long. Do you supply wholesale/ doscount for bulk quantities?